Time to get down to business with a strictly limited run of Dolly Parton's musical at the West End’s Savoy Theatre. Starring Louise Redknapp, Amber Davies, Natalie McQueen and Brian Conley, the smash-hit musical features a book by the iconic movie’s original screenwriter Patricia Resnick and an Oscar, Grammy and Tony award-nominated score by the Queen of Country herself, Dolly Parton. 9 to 5 the Musical tells the story of Doralee, Violet and Judy – three workmates pushed to boiling point by their sexist and egotistical boss. Concocting a plan to kidnap and turn the tables on their despicable supervisor, will the girls manage to reform their office – or will events unravel when the CEO pays an unexpected visit? Inspired by the cult film and brought to you by Dolly herself, this hilarious new West End production is about teaming up, standing up and taking care of business! This production contains comic sexual references, light drug use and the occasional curse word. Dolly Parton will not be appearing in this production. Inspired by the cult-favorite film and with a score from legendary country music star Dolly Parton, “9 to 5” is an uplifting musical about teamwork, unlikely friendships, and female empowerment. The story focuses on three women who all work at Consolidated Industries — Violet, Judy and Doralee. Their sexist boss, Franklin Hart, neglects to give Violet a promotion again, gives Judy an awful first day, and spreads rumours that Doralee is having an affair. The women are almost at boiling point, and unite to jokingly make plans for how they could kill their selfish boss. After unintentionally poisoning him the following day, they tie him up and decide to imprison him. With Hart absent, the women turn the office around and introduce more benefits to the staff, including childcare, full lunch hours, and rehab programs. When the Chairman of the Board arrives to praise the company’s increased productivity, will Violet finally get the promotion she deserves? The musical began its life as a reading in 2007, followed by a week-long workshop and industry presentation. It made its world premiere in Los Angeles, before opening on Broadway in 2009. The original film is ranked at number 74 on the American Film Institute’s “100 Funniest Movies,” and a sequel to the 1980 film is in the works and will geared up to reflect the #MeToo movement. Winner of the 2017 series of Love Island, Amber Davies, makes her West End debut, starring as Judy. The 2009 Broadway production won a Drama Desk Award and was nominated for 13 Drama Desk Awards and 4 Tony Awards, including Best Musical and Best Original Score. It was also nominated for Best Musical Album at the 2010 Grammy Awards. Age Recommendation: 12+. The production contains comic sexual references, light drug use and the occasional curse word. Packed with laughs as big as Dolly’s personality. For every performance, a limited number of £25 Rush tickets will be made available, on a first-come, first-served basis. To unlock this feature, simply spread the word about the production on social media via our app. Rush tickets are available exclusively on the TodayTix app. In order to unlock and access the 'Rush' section of the app, you will first be required to post content via your registered account with Twitter or Facebook from within the app. Although such content will never involve your endorsement of a third party product or service (other than the then-current production featured on the locked screen) please do not proceed to post such content unless you agree with all of it. Unlocking the Rush section of one production will not unlock all Rush programmes in the app, only the production specified. You may purchase up to 2 tickets for the featured musical/theatrical performance once these are marketed within the show section of the app. You must then pay for the ticket(s) without delay to secure them. Promotional terms for participants in the UK (any person who resides elsewhere is not eligible to participate in the 'TodayTix Rush' sales promotion). The promoter of the 'TodayTix Rush' sales promotion is TodayTix, Ltd (the "Promoter"). This sales promotion is neither endorsed by nor in any way associated with: (i) Apple Inc.; (ii) Google Inc.; (iii) Facebook Inc.; (iv) Twitter Inc.; (v) any owner/licensor of any musical or theatrical performance for which tickets are available to purchase under the 'TodayTix Rush' sales promotion and/or (vi) the theatre in which it is performed. 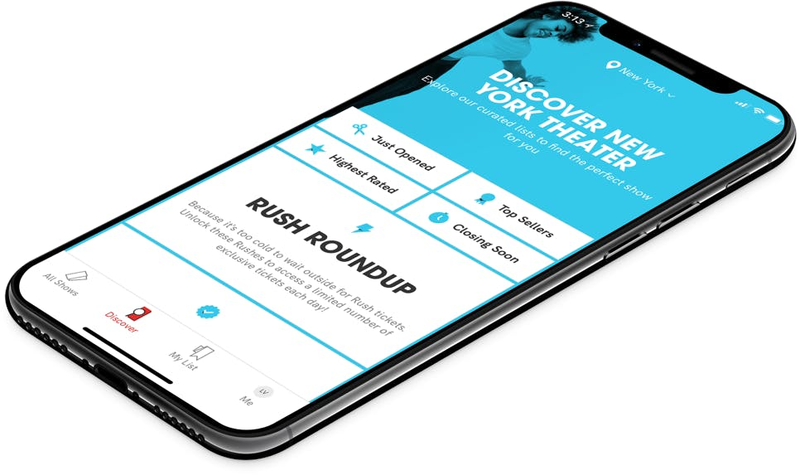 All references to "app" in these promotional terms refer to the "TodayTix – West End Tickets" mobile application which is compatible with iPhone, iPad and Android devices and can be downloaded from Apple's App Store (either iPhone or iPad version) or Google Play (Android version). Each participant must open a registered account via the app in order to participate in the 'TodayTix Rush' sales promotion – please see here [insert hyperlink] to open a registered account via the app. Please note that in order to unlock and access the 'TodayTix Rush' section of the app, you will on each occasion first be invited (but not required) to post content about it to your registered account with Twitter or Facebook from within the app. Although such content will never involve your endorsement of a third party product or service (other than the then-current musical/theatrical performance featured on the locked screen of the 'TodayTix Rush' section of the app) please do not proceed to post such content unless you agree with all of it. Your decision to post content will not affect the ticket(s) available to you in the 'Rush' section of the app and/or their price. Regardless of whether or not you post content, the app will display a payment page to pay for the discounted price ticket(s). You must then pay for the ticket(s) without delay to secure them. less that 1 hour until the featured musical/theatrical performance; or all the discounted price tickets have been sold for it, then the 'TodayTix Rush' section of the app shall not be able to be unlocked from such point until the following date on which discounted price tickets are available for purchase through the 'TodayTix Rush' section of the app – either for the same or a different musical/theatrical performance. PROMOTION PERIOD. You may purchase either 1 or 2 discounted price tickets for the featured musical/theatrical performance from as soon as these are marketed within the 'TodayTix Rush' section of the app. The closing time/deadline for the purchase of such tickets is either:1 hour until the featured musical/theatrical performance; or all the discounted price tickets have been sold. In either case the 'TodayTix Rush' section of the app shall not be able to be unlocked from such point until the following date on which discounted price tickets are available for purchase through the 'TodayTix Rush' section of the app. Only 1 or 2 tickets may be purchased for any particular performance per person. ELIGIBILITY. This sales promotion is open to anyone aged 18 years or over resident in the UK only, who selects the 'TodayTix Rush' section of the app, excluding employees of the Promoter and their families, the Promoter's service providers, agents and anyone professionally associated with this sales promotion. HOW TO PARTICIPATE IN THIS SALES PROMOTION. To participate, please select the 'TodayTix Rush' section of the app and post the proposed content about this sales promotion to your registered account with Twitter or Facebook from within the app. If you decide to proceed and post such content then the app will then display a payment page to pay for the discounted price ticket(s). You must then pay for the ticket(s) without delay and always within 1 hour of the relevant performance to secure them (otherwise you will lose the opportunity to purchase them). All instructions within the 'TodayTix Rush' section of the app will form part of these promotional terms. THE PROMOTER'S LIABILITY. Except that the Promoter does not exclude or limit its liability for personal injury or death caused by its negligence or for fraudulent misrepresentation or any other liability that may not, by law, be limited or excluded, the Promoter accepts no liability in relation to a participant's participation (or inability to participate) in this sales promotion, including without limitation any use made by a participant of (or inability to use) the purchased ticket(s). If this sales promotion cannot be executed as planned due to technical problems or circumstances beyond the Promoter's control, the Promoter shall not incur any liability and no payment or ticket(s) of any kind will be awarded. The Promoter's determination and decision on all matters will be final and no correspondence will be entered into. Any dispute or situation not covered by these promotional terms will be resolved by the Promoter's management in a manner it deems to be the fairest to all concerned and, subject to the following section, that decision will be binding on all participants. APPLICABLE LAWS AND JURISDICTION. This sales promotion and these promotional terms shall be governed by English law, and a participant agrees that any dispute between him/her and the Promoter regarding this sales promotion or these promotional terms will only be dealt with by the English courts, provided that, if a participant lives in a part of the United Kingdom other than England, the applicable law of that part of the United Kingdom will govern and any dispute will only be dealt with by the courts there. If any part of these promotional terms is found to be unenforceable as a matter of law, all other parts of these promotional terms shall be unaffected and shall remain in force. Any queries and comments concerning this sales promotion should be directed in writing to "TodayTix Rush", TodayTix, Studio 2, 123 Curtain Road, London, EC2A 3BX.